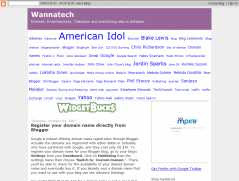 >If you had visited this blog in the past, you’ve certainly noticed that I’ve added an additional column to my template and increased its width (see an archive of the old wannatech template at archive.org). I wasn’t always a fan of three column templates but as my sidebar was getting longer I knew that one additional column would allow visitors to see more sidebar content without having to scroll. I did not want to switch to another template and hopefully I found an easy step-by-step guide to changing a two-column-new-blogger template into a three-column-new-blogger template on LawnyDesignz. This entry was posted in New Blogger, Template by admin. Bookmark the permalink.